Administrators and fire academy students joined together to celebrate the grand opening of the second fire station on NW Campus. NW fire service training center director, Steve Keller, was one of a few administrators to discuss the significance of the station during the ceremony. “We were standing in the fire station, and there was barely room for me and Dave. Because everything you saw coming into the facility was crammed into Fire Station 1,” Keller said. With the opening of Fire Station 2, the students in the fire academy can have not only more room but the freedom to house their equipment in different spaces. “We had both engines and both trucks crammed in there plus all the extra equipment,” 88th class fire academy student Gabe Stewart said. 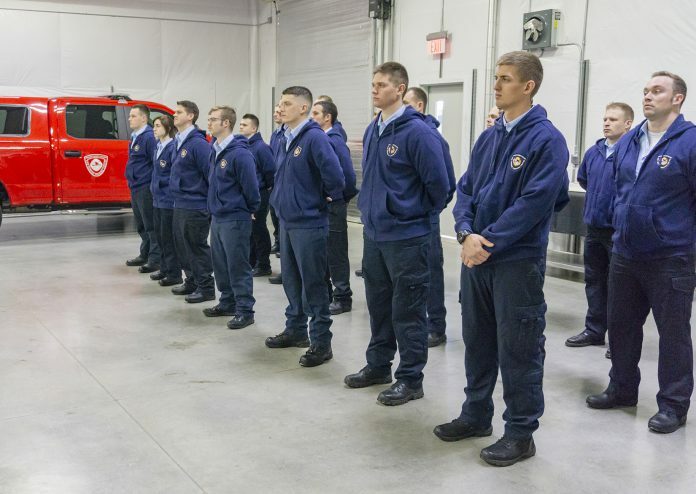 Before the opening of the new fire station, students would have to use spaces for multiple functions, said Robert Cabrera, 88th class fire academy student. “We currently eat our food, store our food and wash clothes in one room”, he said. First year student of the 88th class, Bethany Miliara, said she was excited there is a new facility. “Although it does seem like a smaller building, it is still another building for us to be able to practice, put equipment in and overall to give us more space,” she said. NW Campus president Zarina Blankenbaker spoke during the opening ceremony and acknowledged the different teams and administrators that made the creation of the new fire house possible and its importance to the program. “Graduates serve all areas in the region as well as across the nation. In addition, over 5,000 first responders come to us on a regular basis to receive in-serving training annually,” she said.